An important part of the Double Road Race® is the awards and the prize money awarded at each event. All Double finishers receive an unique commemorative two-sided key-chain medal. The top five finishers in 5-year-old age groups up to 75 plus are awarded a special large two-sided medal. 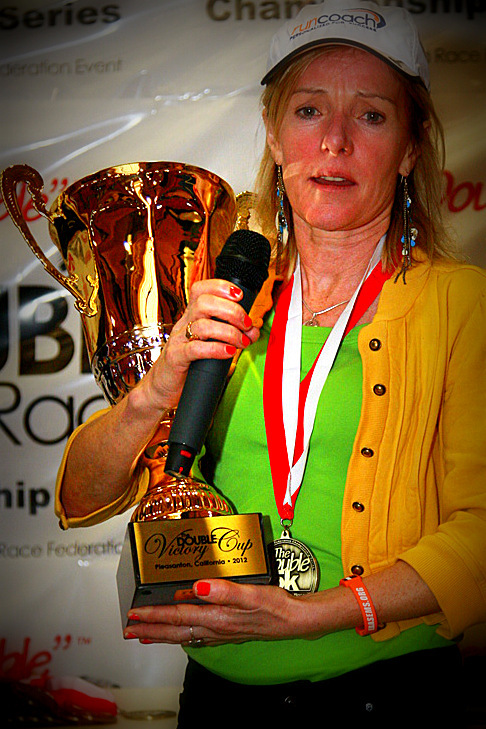 Unique to the Double, at least 40% of the prize money is awarded to runners 40 plus. At least $4,000 of prize money will be awarded at each Double. $500 of bonus money will be awarded for world record performances. $10,000 will be awarded to the top 10 men and women bested on the 2013 Leader Board! 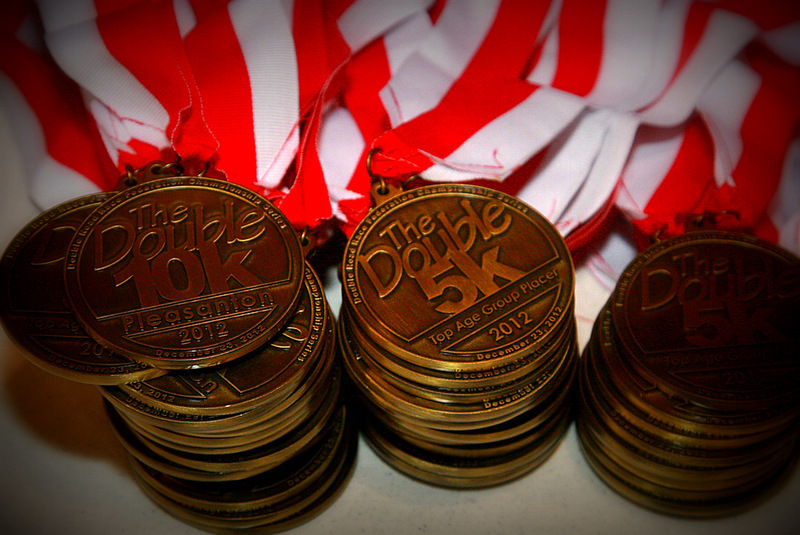 Over $50,000 of prize money will be awarded to runners during the 2013 Double Road Race Season! Double Road Race Awards and Prize Money - Over $50,000! At each Double Road Race® every competitor will receive a logo high performance men's and women's shirt, a special DRR logo Draw String Back Pack and a four-color magazine-size program. All Double Road Race® finishers receive a DRR logo Custom Finishers Medal. A special DRR logo two-sided medal (pictured above) will be awarded to the top five men and women in each age group 19 and under, 20-24, 25-29, 30,34, 35-39, 40-44, 45-49, 50-54, 55-59, 60-64, 65-69, 70-74 and 75 and over. The Grand Champion at each Double 15k is the runner (man or woman) who posts the best age-graded performance. Our overall winner will be presented the Double Victory Cup. That person wins the same prize money as the first place man and woman. That amount for 2014 is $300. At least $4,000 of prize money will be awarded at each Double 15k being staged in 2013. $1400 of it will be awarded to the top three men and women in the following age groups: 40-49, 50-59, 60-69 and 70 plus. First place will receive $100, second $50 and third $25. At each Double 15k there is also a $500 bonus being offered for a world record. Prize money for each Double is detailed on each location website. In addition to the prize money awarded at each Double Road Race, $10,000 of prize money additionally will be awarded to the top ten men and women for the 2013 season. For details: 2014 Double Road Race Leaderboard. Points are given to all runners who finish a Double Road Race. The more Doubles you run the more points you will receive. The male and female runner with the most points win $1350. You have to be a current Ujena Fit Club member for your points to show up on the Leader Board. It is your responsibility to enter your correct Double Road Race information after completing a Double.